The station is St Albans (Abbey) - in the 1930s or 40s. Camera: pointing more-or-less east. Buffers are behind the photographer. This is the only LNW/LMS platform at station. Loco: 5ft 6in 2-4-2T No 67xx - number no doubt visible on print but unreadable on screen. Branch came from Watford Junction, 6+ miles away, off to right. 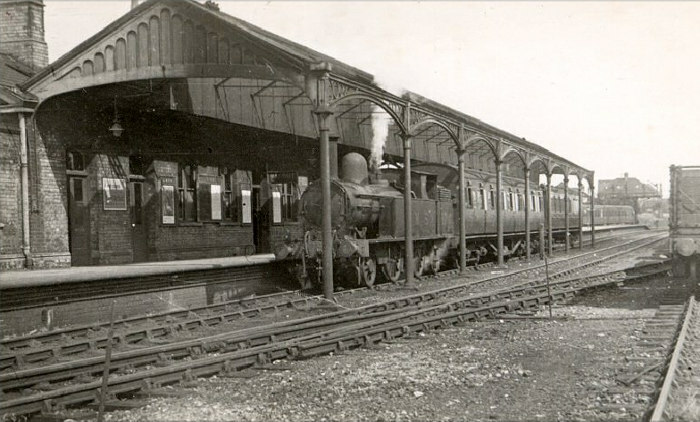 Distant string of carriages at other platform: LNER on train to Hatfield (ex-GNR branch, closed to passengers 1951). The sidings on the right served the St. Albans Gas Works. The engine to shunt here came by passenger train, piloting the 6:55 am from Watford. The normal combination in the 1950s was 47355 piloting Stanier 0-4-4T either 41908 or 41909. The branch engine always operated at the St. Albans end of the 2 coach push-pull set. The four starters in the background are, from left to right, (1) GN bay to Hatfield, (2) GN bay to Watford Junction, (3) LNW platform to Hatfield, (4) LNW platform to Watford Junction.